On 20 January 1955, Baba went to Khuldabad with Eruch, Pendu and Baidul in the Vauxhall. Chhagan was called from Ahmednagar and met them there. Baba worked in seclusion daily in the dargah of Hazrat Zarzari Zar Baksh, as well as in other tombs, and the mandali would keep a strict watch all around so that even the sound of a chirping bird would not be heard by Baba. 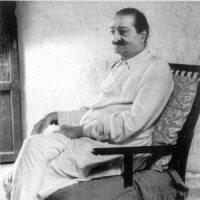 Avatar Meher Baba wishes all his lovers to know that his seclusion which was to continue until the 25th of February 1968, will continue until the 25th of March 1968, when he will complete his seclusion. Baba wants his lovers to know that by this date the phase of his Universal work in seclusion will end, and that there will be no further seclusions. To help him in this work, Baba wants all his lovers to recite once daily the Master’s Prayer (O Parvardigar) and the Prayer of Repentance, individually or collectively, from the time they receive this circular until the 25th of March 1968, and also to observe complete silence for 24 hours from midnight of 16 March to midnight of 17 March 1968.